Approximately 90% of cancer deaths can be attributed due to metastasis, the spreading of primary tumor cells to distant organs. Siyuan Zhang’s lab works to further our understanding of the early stages of metastasis and in turn, how to treat it more effectively. 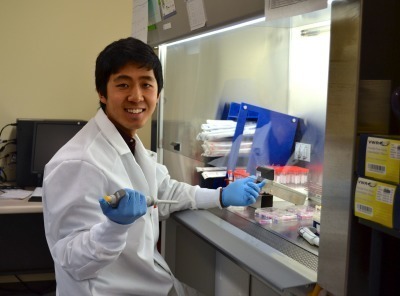 Under the guidance of Zhang, undergraduates like Dennis Lee are using genetic editing tools to create lineage reporter cell lines and investigate the evolution of metastasis through intravital two photon imaging. Sophomore Dennis Lee is a biology and psychology major at Notre Dame. Lee is a part of the Building Bridges Program and received Zhang, the Nancy Dee Assistant Professor of Cancer Research at the Harper Cancer Research Institute, as a mentor. Building Bridges is a mentoring program that matches underrepresented freshmen with faculty from the departments that students wish to explore as possible majors. With no previous lab research experience, Lee shadowed the Zhang lab during the spring semester of his freshmen year and officially the research group joined this past fall. “To put it simply, we are generating dual-reporter cancer cell line through genetic editing that can be distinguished as ‘loose’ invasive metastatic state, or ‘sticky’ tumor state. Afterward the injection, through cranial window in vivo imaging, we’ll be able to directly observe evolution of metastasis in their microenvironment,” Lee said. As researchers gain more knowledge on the mechanisms behind metastatic evolution, more new therapies and clinical trials can be done. “While early dissemination is a formidable characteristic of aggressive tumors, limiting the outgrowth of the disseminated tumor cells holds the promise of preventing or converting deadly metastasis into a manageable chronic disease. Unraveling the mechanisms of metastatic evolution poises to present multiple therapeutic entry points for novel anti-metastasis therapies and serve as a blueprint for future adjuvant and new adjuvant clinical trials for metastasis prevention,” Lee said. Last summer, Lee interned at the NYU Langone Medical Center, and by working alongside Dr. Douglas Kondziolka, he was inspired to pursue clinical research, particularly in neurosurgery. Through his internship, Lee realized that over 50% of his patients suffered from brain metastases. “This clearly highlights the importance of understanding cancer. In the future, I aim to bridge the gaps between surgery, radiation, and chemical treatment and find novel ways to conduct neurosurgery to treat and prevent metastatic cancer,” Lee said. Originally published by Angela Cavalieri at harpercancer.nd.edu on April 23, 2014.